Over 1000 years ago, the Belgae fought the Norse. Over 1000 years ago, the Belgae tribes of southern Britain fought many invaders. To the Romans, the city which we now as Winchester in Hampshire county was known as Venta Belgarum. 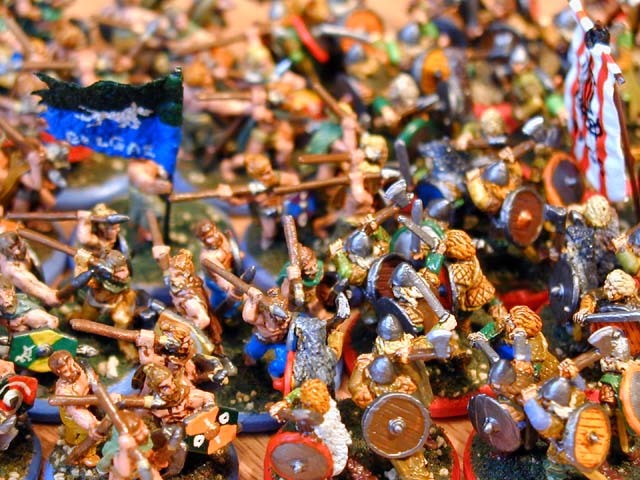 This fierce tribe fought partially naked with spears and other iron age weapons. They adorned their shields with emblems of horses and other ancient symbols in white lime dust upon colorful backgrounds. They fought off all manner of greedy invaders. To the Norse, the fields of southern Britain were a fertile and temperate land. They knew the cities of these people contained much wealth and gold. The Norse invaded with their shallow draft longboats, plundering the villages and taking all they could. The Norse fought in animal skins and padded leather armor with heavy two-handed axes and swords. These two ancient and mighty cultures met on the battlefields in many encounters. When they did, they both beat their shields and bellowed in a loud and thunderous roar. The skies darkened, and the lightning cracked as the two sides raced on foot toward the other. When they met, their swords and spears hit home, slashing flesh and cracking bone. The horrific screams of the warriors! The earth turned red with the blood of the fallen! The epic battles of the Norse and the Belgae! 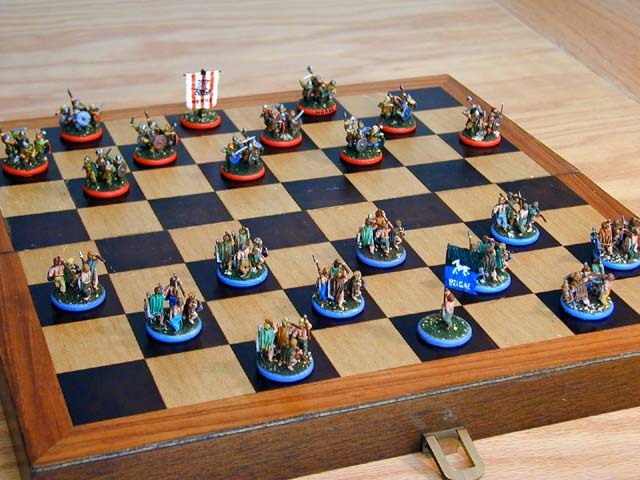 And now to commemorate these battles, the Franklinstein Mint offers you the Britannia Checkers set. This set is handcrafted by master painters using the finest quality lead miniatures and hard wood bases. Each combat unit is represented by four warrior figures in life-like kinetic poses. Each command unit is represented by a warrior figure holding a miniature standard representative of these two civilizations. The 15 mm figures are masterfully modelled and cast by Old Glory Miniatures. Each unit stands on a hand-flocked base reminiscent of the rocks and sod of Ancient Britain. 11 units are supplied, almost enough to play a standard checkers game. The board itself is formed by master woodworkers and stained in light and dark varnishes. It hinges in the middle to form a box to hold the miniatures. The game is portable and small enough to play on the subway, a board room presentation, or your next customer meeting. Miniatures rules sets are available for use with these figures. Adapt them for use on the checker board, or use the Britannia Checkers miniatures in your next table top miniatures battle. Rules sets (in 5 volumes) are available for as little at $119.95. You and your family will cherish this set for generations. Just imagine the delight of your youngster's face as he imagines himself with a serious and deadly flesh wound in the middle of this ferocious ancient battle. And then your young ones can pass it on to their kids, so that the grandchildren also can delight and amaze at the thought of smashed knee caps and sucking chest wounds. Your friends too will amaze at all the furious battle enactments that can be made with this set. Why not invite them over and let them also enthrall and take pleasure in the ancient art of pole and axe fighting. And all this is available for only $899.95 or 52 payments of $19.25. Act now while supplies last. A panorama of this exquisite checkers set. Seriously folks, these figures are a preview of miniatures I am working on for a deluxe edition of Avalon Hill's Britannia . The game depicts the military history of Great Britain from the 1st century A.D. until 1066 C.E.. Over 17 civilizations are featured in the game including Belgae, Norse, Romans, Saxons, Welsh, Danes, Anglos, Scots, and Normans. More information on this game is available at Britannia Home Page. Last modified: Thursday, 09-Jun-2011 12:35:31 MST.